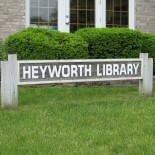 This certification class, taught by Jon Stanek, will be held Saturday, May 4, 2019 at Heyworth Public Library District in the Community Room. Sign-up is required. The class size is limited to 10; must be at least 12 years old. Select the link above for more information. Books, Tea, and Conversation will meet on the first Thursday of each month at 6:30 p.m. Sign up is encouraged so we can reserve titles. Coffee and tea provided, bring your favorite mug. Adventure Book Club meets on the 4th Thursday of the month! 3rd – 6th graders are invited to join us at 3:30 p.m. to read, discuss, and do activities based on the selected book. Sign up is encouraged so we can reserve titles. Join us for stories and crafts Thursday evenings at 6:15 p.m. each winter, summer, and fall. This program is designed for pre-K through 1st grade and their families. Click the link above for specific dates and programming information. This LEGO building group will meet with April Fisher (AKA the Lego Lady!) on the 2nd Wednesday of each month during the school year (September – May) at 3:30 p.m. We encourage kids from Kindergarten – 8th grade to join in this hour of the building. 6th — 8th graders are the model builders who help the younger apprentices along the way. Snacks are provided. 6th Graders and up are invited to join us on Wednesdays at 3:30 p.m. Knitting mentors and supplies will be available. Community Care Systems, Inc., Senior Information Systems Agency for McLean County, will be at the Heyworth Public Library on the 4th Wednesday of each month from 10:00 a.m. – noon to assist people over the age of 60 and the disabled with Information and Assistance in filing for local, state, and federal programs. Their main office is located at 616 IAA Drive, Bloomington, IL 61701. CCSI, Senior Information Systems Agency for McLean County can be reached by calling 309-661-6400 or 1-888-322-5712. Walk-ins accepted, no appointments necessary.